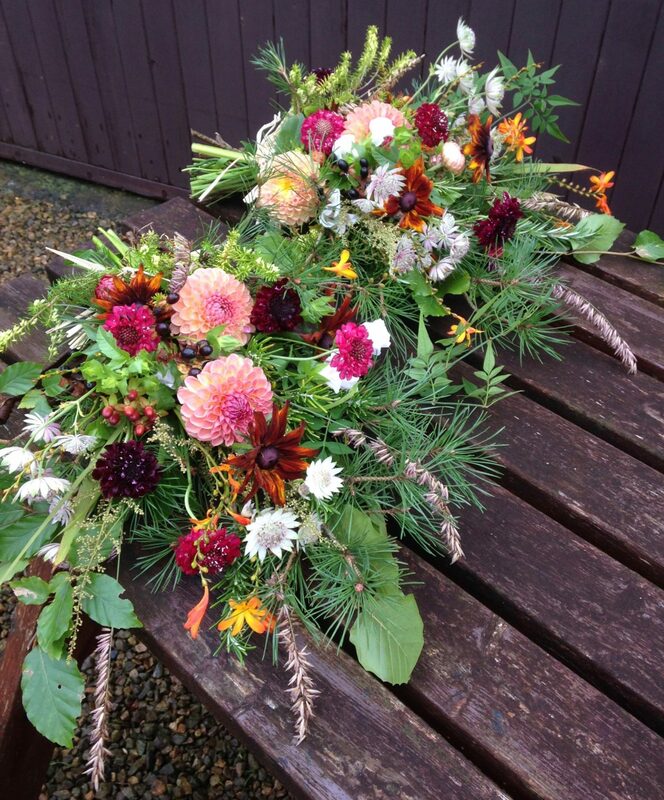 I take great pride in making natural funeral flowers, believing that flowers for a funeral service should match the ethos or outlook of the deceased. Last week was a request for flowers that would combine Tanzania and Scotland. It turns out that crocosmia would be an ideal common link, growing wild in Tanzania and naturalised in gardens and roadsides here in Scotland. Orange crocosmia also fitted well with an autumn theme and with the addition of Scots Pine and heather along with a few other requests from the family it made the seasonal funeral sheaf a very personal tribute. All picked just before Storm Ophelia struck. Two flat backed bouquets (pictured) and the main sheaf were posted off to the Funeral Directors in England and I received a lovely thank you note and copy of a social media tribute to give an insight to why my natural flowers and the ethos behind them was so important to this family. It turns out that their mum had been a conservationist in Tanzania and born in Scotland. These flowers are so beautiful – I love that you made the link between the crocosmia grown wild in Tanzania and Scotland. Brilliant!